Just a sample…of some of our work! These earrings that are being given away for FREE were made by Linda Pratt who has been with EBEG for quite a while. She is as she says an “Artist of the Highest degree!” , and she truly is. 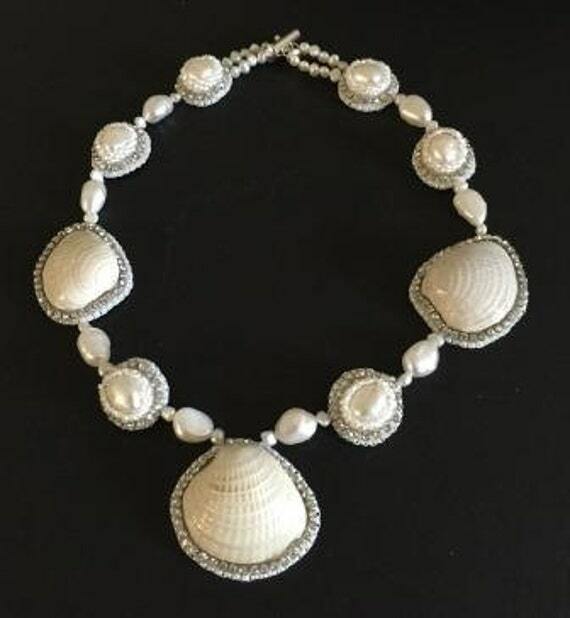 We are so proud to have her as a member as she not only does beautiful, extremely well made jewelry, Sarah Palin is a big fan of her work and wears her pieces quite frequently. 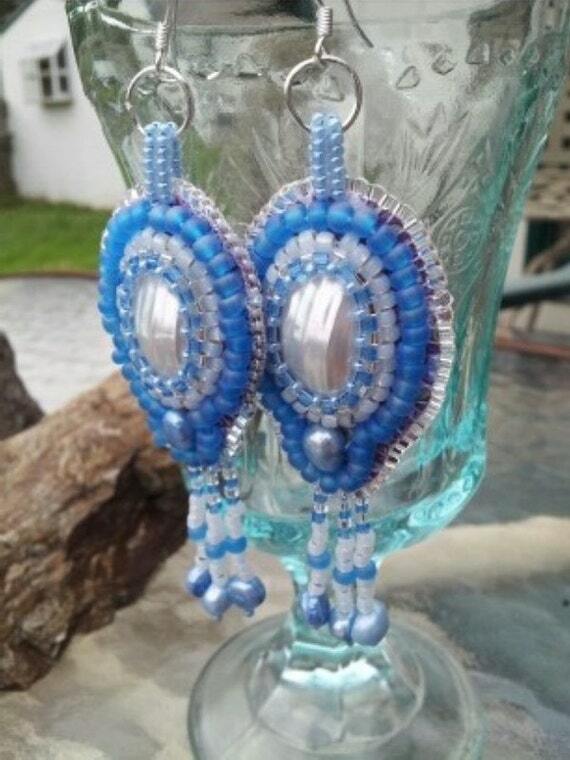 The earrings she has offered up are not bead embroidered, but are rather bead woven and something she teaches in classes. This particular style she has titled, “Night at the Opera”. You will want to be sure and check out her work in her shop on www.etsy.com/shop/beadifuljewelry. So now how to win in case you don’t know. Just make a comment below this page and make sure I have your email address. We will have the drawing on June 15th. Members of EBEG are not allowed to sign up but friends and family are. We do not use your email address for any other purposes. I will contact the winner via your email address and if I do not hear back from them within a week, I will draw another name. This has actually happened before. Can you believe it? So there you have it. Plain and simple. Leave a comment and these lovely earrings could be yours. Please let all of your friends know about this free giveaway. And we really would love for you to check all of our members work out on etsy.com. You can do that by going to etsy.com and doing a search by typing in EBEG, or Etsy Bead Embroidery Guild. You will be amazed! Marie Mccurry is the winner of our free giveaway. Please contact me Marie as soon as you can! Back in action. Today we are posting our first free giveaway to help promote our members’ work. This is a pair of lovely mother of pearl earrings with light blue freshwater pearls added for enhancement. These are very light comfortable earrings with sterling silver ear wires. They are just in time for those pastel color springtime fashions hanging in all the stores right now. I did notice there are some materials being used with flowers on them, but mostly solid colored clothing. These earrings would be a perfect match to wear this summer. I really do like the springtime fashion colors this year, mostly soft pinks, blues and even whites. All you need to do to sign up to win these eye catchers is leave a comment below. I also need you to give me a way to contact you whether an email address or phone number to call so that I can notify you when you win. We did about 5 of these in the past. No strings attached, just make a comment below this page. There will be a random drawing of names, one entry per person, members of the guild cannot sign up. But you can recommend any and all friends and even family members to make a comment. We will have the drawing on May 6th, 2016. I will contact the winner and if I do not hear back from them within a week, we do another draw. Believe it or not that has actually happened before. Good luck to all and be sure and tell your friends and family. EBEG blog is back online! Good afternoon! Happy news. I am happy to say our blog is now going to be back in full swing again. OH how I have missed writing this and sharing EBEG members’ work and giving free pieces away. I have a lot of new ideas of things to talk about and do on here. First, I want to thank everyone members and friends alike for your kind thoughts for me while I was away dealing with family business. Secondly, I would like to congratulate all of our members who are entering the Battle of the Beads competition. I can’t wait to see what wonderful creations everyone comes up with. Good luck to all! This is just a short note to let everyone know EBEG is back and ready to roll. Please stay tuned for our upcoming challenges to be posted, free giveaways and information on our members who might be having sales. Better yet, why not go to EBEG on etsy.com and take a look at all the beautiful things we have to offer. You will not be disappointed.Take care and stay tuned. This is a painted mother of pearl pendant. 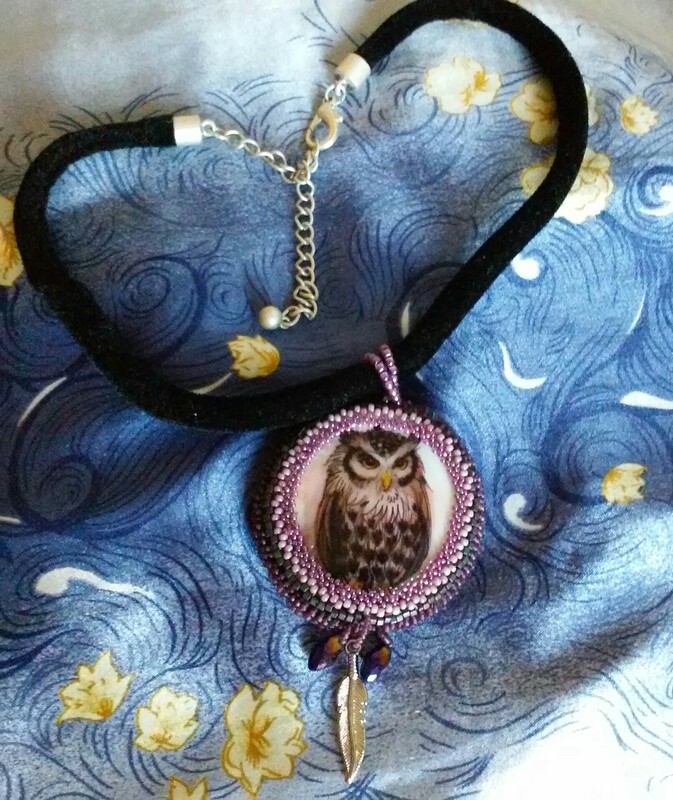 It comes with a soft black velvet adjustable necklace. You could even swap out the black necklace with a silver chain or any other type of necklace. You might use a wider type of ribbon, perhaps another black one or purple would like nice as well. All you have to do to be entered in the drawing is to make a comment below and make sure to leave your contact information. If you sign up to receive our blog, you can put your email address in at that time. We do not use your information for any other purposes. We do not share our lists of contacts with any one else. Feel free to tell your family and friends about this drawing. The only stipulation is that members of the guild are not allowed to enter. Unfortunatly in one drawing we had, we tried to contact the winner and never received a response and so then we had to draw another name. Because of this we will give you 3 days to respond before we have to draw another name. We will also announce the winner here on our blog on October 15, 2015. EBEG is so glad to have you as followers. This drawing is a way for us to get exposure for our members’ work on Etsy.com. So if you have time, go to etsy.com and type in EBEG in the search box and WAh – lah! Be prepared to be amazed at the awesome work our talented members make. Some of our members have coupons available and some of them have sales going periodically. You won’t know unless you take a look! Thanks for entering and good luck to all! I am so happy to announce I am going to start working on the EBEG blog again. I still have some personal issues at hand to deal with, but I now have a bit more time to work with our guild and try to get things back on track again. I at least have time to post here on the blog. We will be starting things again with a new giveaway. I will be posting it very soon. So please, be on the lookout. You won’t want to miss this “Early Fall” freebie. That’s all I can say for now. Thanks to all who have participated in the past and I hope you be sure and check back in a couple of days. The item being given away will be a piece that can be worn by anyone and is a great Fall themed item. I also want to say thank you to the members who have continued to post items on our Facebook page. Your work continues to astonish me. I need to say thanks too for the awesome well wishes I received. My life, like many of yours I am sure, is very complicated right now. For now I can at least work on this blog which I feel is a really important part of EBEG. I will be happy when I am back at home and beading again. 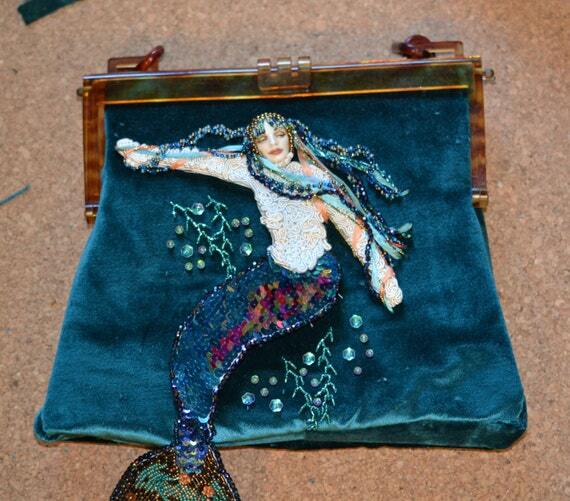 Ocean Life is the theme of this EBEG Bead Fest. All these treasures were collected on the beaches, at Bimini, rocks from La Jolla and tiny shells from Oregon. This bright and sparkly piece measures 30″ long. 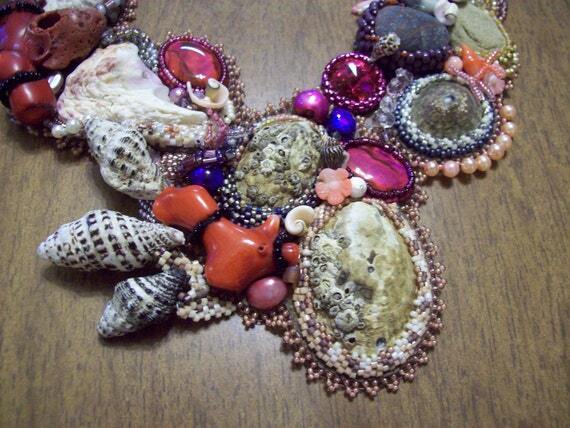 The shells, rocks and beads are all embroidered into a bib style collar and set with a chain extender. A handcuff clasp makes a secure closure on the back. What a great way to keep summer beach memories. This is a true piece of art given by the sea. 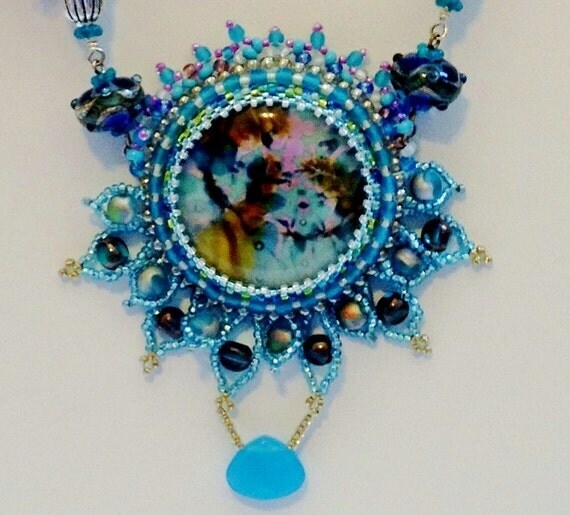 A Jeff Barber glass cabochon is the focal point of this necklace. 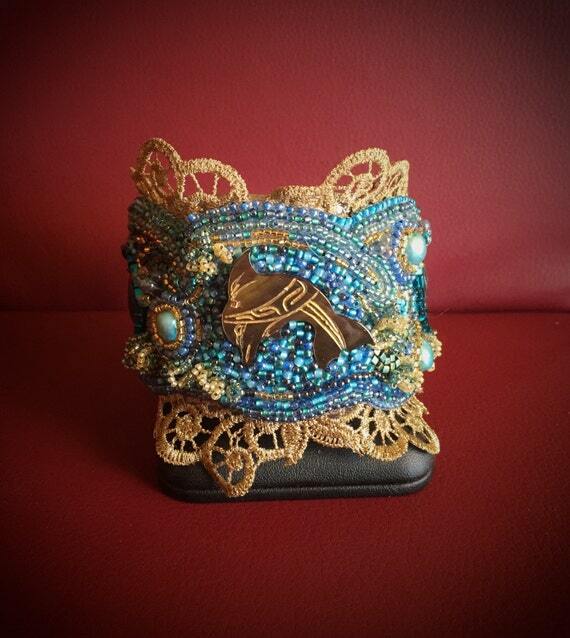 A black lip shell dolphin is the centerpiece of this cuff bracelet. 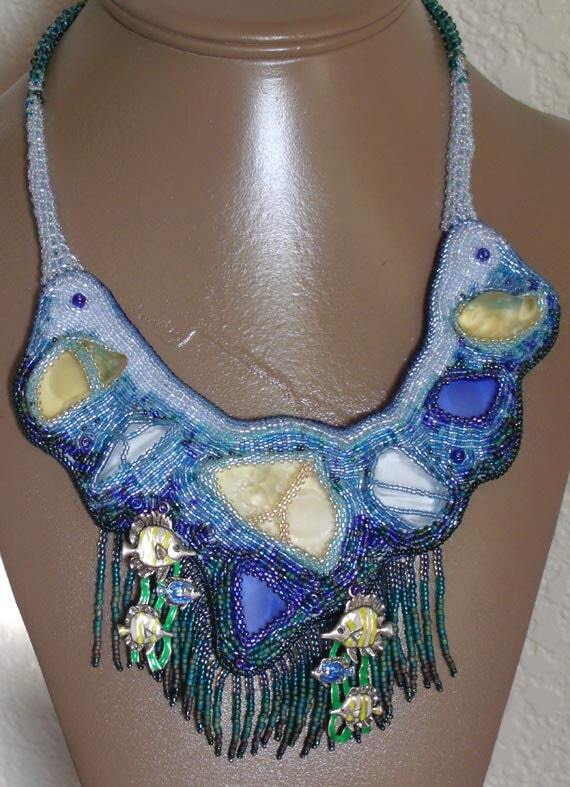 It represent ocean life and is ornated with paua shells cabochon, dyed light blue green freshwater pearls and Many shades of blue and gold seed Beads and delicas Beads. 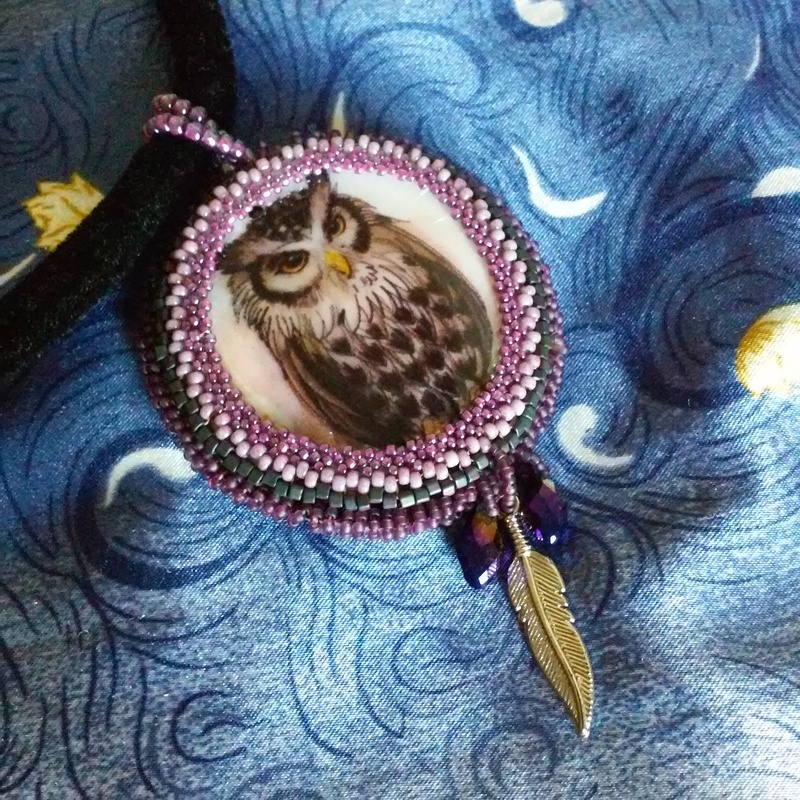 Posted in Bead Fest and tagged bead embroidery, cuff bracelet. Bookmark the permalink.